Fitting Fitting generally represents the Base Curve and Diameter of the lens in mm. Typical values range from 8.00 to 10.00 for Base curve and 13.00 to 14.5 for Diameter Power Often called 'sphere' or 'strength. Measured in diopters and always preceded by - (minus) or + (plus). Negative (-) powers are prescribed to help correct short sighted conditions. 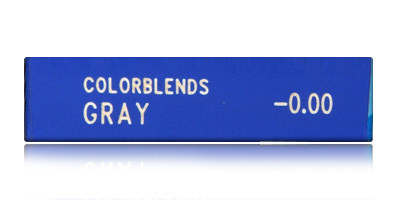 Positive (+) powers help to correct a long sighted condition Colour Pick the colour that suits you. Generally your colour choice should be based on your skin tone and hair colour and the kind of look you want. Those with light eyes wanting a natural look could go for grey or green. For a dramatic look you could go for a warm toned lens such a brown. Those with dark eyes wanting a natural look could go for a lighter honey or hazel colour. Those wanting a standout look could go for vivid colours like Blue, Violetor green tones. 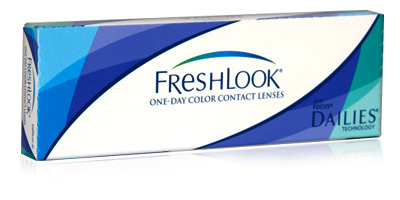 Freshlook One Day contact lenses combine excellent vision quality with comfort, the convenience of being a daily disposable lens and great breathability. 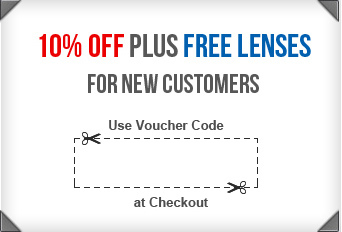 Freshlook One Day lenses don’t put fashion before function. They perform equally well on both fronts, giving the wearer a gorgeous eye colour and consistently stable, sharp focus. 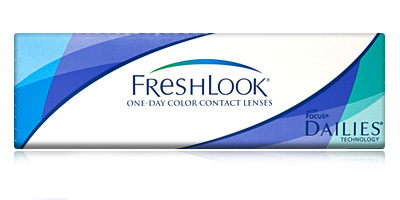 An exceptionally high water content combined with a soft and very permeable material makes Freshlook One Day contact lenses one of the most breathable coloured daily disposables available. More oxygen than usual is allowed to permeate each lens, which means eyes can stay consistently hydrated and free from dryness and irritation, which often leads to blurred vision. Each box contains 10 daily disposable lenses. For help and advice on all types of contact lenses or Freshlook one day contact lenses, talk to a member of our dedicated team by calling 0330 088 3133.